Despite hundreds of attempts, only a select few beer brands have made the successful transition from local to global. Kos Apostolatos, David Atkinson and Joseph Poore from management consultancy firm Marakon examine the successes and failures of global brand building in beer, market dynamics and best practices across the FMCG sector. When Freddy became chairman of the Board, he pushed hard to expand Heineken beyond its local origins. Although Freddy had a dream to build a global beer brand, what people often don’t know is that he did not have any formal marketing education or detailed knowledge. His approach was primarily entrepreneurial and instinctive. His experience in America helped him understand that a beer brand has to be unique to be successful globally. Freddy realised that in each market around the world there was a pocket of similar consumers that would drink Heineken, and he strove to reach them. Although Freddy made the big difference in early days, his successors like Thony Ruys and Jean-Fran?ois van Boxmeer deserve credit for developing a leading export business model that ultimately took the brand to over 170 countries, generating 25 million hectolitres of sales volume and premium pricing in most markets. 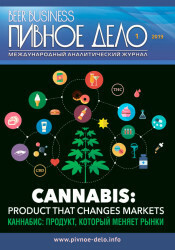 Amazingly, all this happened in the absence of an experienced professional marketer in the lead until the 2010 recruitment of Alexis Nasard as chief commercial officer, who immediately made it his top priority to accelerate the brand’s growth and complete the “last mile” of the brand’s globalisation. Under recent leadership, Heineken has re-entered Interbrand’s Top 100 global brands at 91, the third ranked beer behind only Budweiser (29) and Corona (86). It stands alongside Coca-Cola (1), Pepsi (22), Jack Daniels (78) and Smirnoff (89) as a truly great global brand, and Alexis aims to have the brand as equally recognised as Apple, Google and Nike. 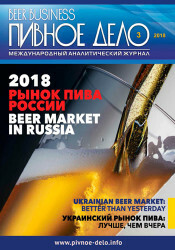 Today more than 75% of beer sales are still on local brands in every major country, and international brand volume represents only 11% of the global total. Why have so few other beer brands been able to achieve the same long-term, global success as Heineken? Having spent the last six months working to answer this question, Marakon will unveil the four secrets to building a successful global beer brand, together with analysis of the current state of the international beer market, in a series of articles over the coming weeks. Despite remaining a highly localised product, the beer industry has seen dramatic consolidation over the last decade, with a significant impact on profitability. Having examined the steps which led to Heineken’s successful positioning as one of the world’s few global brands, Kos Apostolatos, David Atkinson and Joseph Poore from management consultancy firm Marakon consider the impact of consolidation on the beer industry. Beer has been sold in similar form and taste for thousands of years. 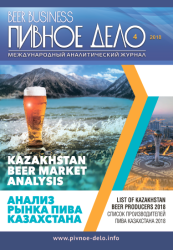 Local tastes, high transport costs, short shelf life, availability of ingredients and packaging, taxes on imported alcoholic products and impenetrable local wholesale networks have ensured beer remained a highly local product. As the wave of industrialisation followed by globalisation swept change through the world, the beer business evolved but largely remained local. On the other hand, consumer goods companies like Coca-Cola and Pepsi are different. Free from the constraints of historical taste preferences, legacy systems, laws and infrastructure, they have been able to innovate and change across areas such as outlets, channels, distribution and packaging. Using one key brand, they grew their business with a global mind-set from the start. 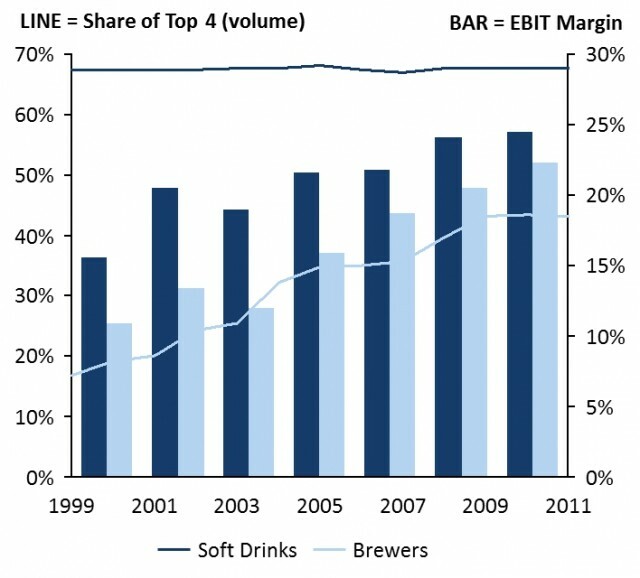 The beer industry has consolidated dramatically over the last decade. In 1999, Coca-Cola and Pepsi together controlled almost 70% of worldwide soft drinks sales, whereas the top four brewers generated only 17% of global beer sales. 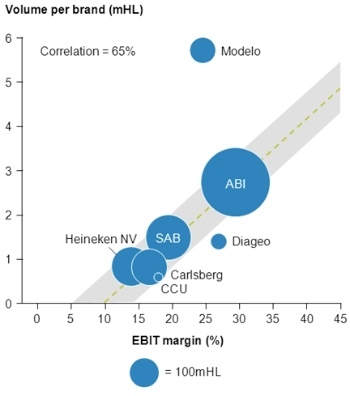 Beer was viewed as one of the least consolidated, and least profitable, industries in FMCG. Today the top four brewers account for 45% of global volume and over 55% of global revenue. The profitability of the beer industry has doubled (see Figure 1) because of greater scale, multiplier effects of reduced competition and the profitability of emerging markets. In local beer markets, brand consolidation is likely ?to continue. Beyond industry consolidation, brand consolidation brings further tangible and intangible benefits, including operational leverage, efficiency in advertising spend and increased consumer recognition. Companies with higher volume brands tend to be more profitable (see Figure 2). Brand concentration is slowly starting to occur across both developed and developing countries (see Figure 3). 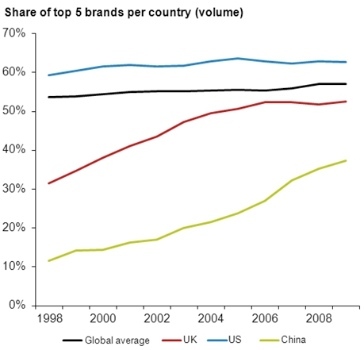 For example, the top five brands in China now represent 37% of the market, up from 12% 10 years ago. In the key African markets of Nigeria and South Africa, Star and Castel are leading the way, growing share at the same time as the growing market becomes more profitable. These trends toward both industry and local brand consolidation in beer, and historical trends across other FMCG industries, indicate the future is set up for continued attempts to develop global beer brands. As we analysed hundreds of beer brands, it was striking to see that for those that had made the transition from local to global, there was no common reason for their success. 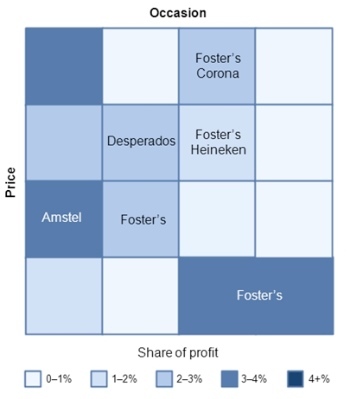 What unites the eight global beer brands is that they have a unique customer value proposition to the customer and/or have an advantaged business model. Through our research we consistently heard that to build a global brand you need great taste, local image and a brand that is currently profitable. We believe these factors were, and remain, critical to building a local but not global beer brand. Being very good in a number of areas is not enough to give a brand the front running in the global market. The starting point for selecting the right brand to take global is a unique customer value proposition. Uniqueness means that there is a place in the mind of the consumers where your brand sits alone with clearly identified consumer “benefits”, ultimately driving strong buying behaviour and loyalty. Why are taste and profitability not as important as a unique customer proposition? Consumers are embarrassingly poor at differentiating between lagers in blind taste tests. A Carling study found consumers could not identify a significant difference in taste across five of its competitor’s lagers nor could they identify their favourite brand as having superior taste. Once labelled, the consumers immediately ranked their preferred brand as superior across taste factors. Taste, to a large degree, is all in the eyes rather than the palate. We also heard brewers should choose which brand to take global based on how profitable the brand currently is in key countries (with the idea being that if you are successful locally, you have a better chance of becoming successful globally). We believe that this will lead to the wrong brand being promoted on many occasions as profitability is a not a leading but a lagging indicator of the overall success of a brand. We discovered that brands that fail to identify (and sustain over time) a material point of uniqueness on the global consumer map will fall into a negative cycle, slowly reducing volume and profitability in all markets over time. 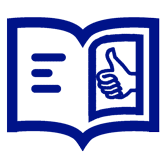 Unique brands are able to leverage their strengths to increase consumer appeal and grow rapidly. Having stressed the importance of creating – and sustaining – a sense of uniqueness for the global consumer, Kos Apostolatos, David Atkinson and Joseph Poore from management consultancy firm Marakon, compare two brands who got this right and wrong.